1. Bring a large pot of salted water to a rolling boil. 2. Trim the asparagus to remove the white fibrous ends. Cut the asparagus into 2 inch pieces on the diagonal. 3. Add the asparagus to the boiling water and cook until the spears are bright green and just tender, 4 to 5 minutes. (If necessary, cook the asparagus in batches.) Drain the asparagus in a colander and rinse with cold water until the asparagus is chilled. The asparagus is ready to dress and serve now, or it can be held in a covered container in the refrigerator for up to 6 hours. 4. To make the vinaigrette, whisk together the vinegar, mustard, parsley, tarragon, salt, pepper, onion powder, and garlic powder until blended. Add the oil to the vinegar mixture in a thin stream, whisking constantly. Season with additional salt and pepper, if needed. 5. 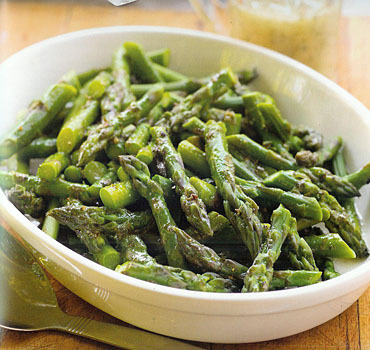 Toss the chilled asparagus with the vinaigrette or pass it separately on the side. Serve immediately on a chilled platter or plates.